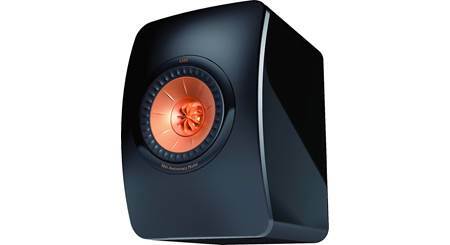 Building a KEF Q Series surround sound system? 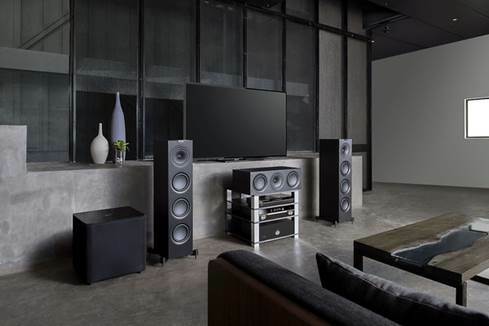 Then the Q650c is the perfect choice for your all-important center channel. You'll enjoy a rock-solid center image and smooth, natural sound that lets you get the most out of movie soundtracks, TV shows, and sports broadcasts. 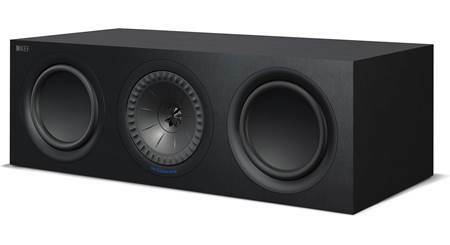 Use the KEF Q650c center channel speaker as part of a Q Series home theater system. 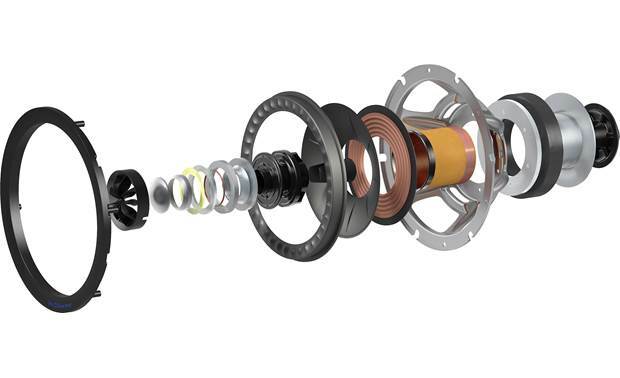 KEF's patented Uni-Q technology places this speaker's 1" tweeter in the acoustic center of the middle-most 6-1/2" woofer. This concentric design allows sounds to originate from a single point source, making the "sweet spot" (the ideal listening position) much larger. 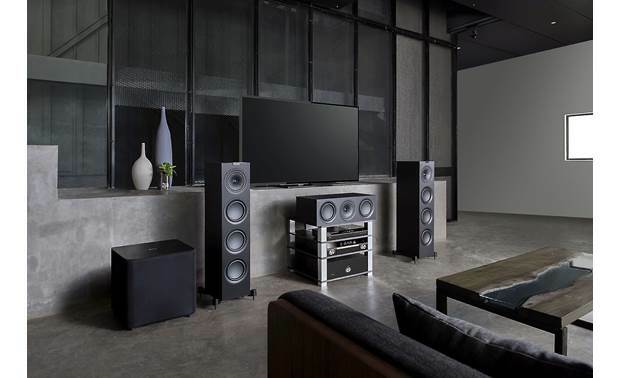 Here at Crutchfield, we've had the pleasure of hearing Uni-Q technology in person many times, with KEF's super-popular, award-winning LS50 speakers. Sit wherever you like — you'll enjoy detailed dialogue and immersive center stage special effects throughout your room. 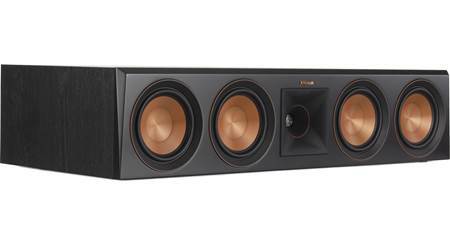 The Q650c uses two different 6-1/2" woofers to deliver solid bass response. In addition to the 6-1/2" Uni-Q array, there's a separate 6-1/2" low-frequency driver. The third 6-1/2" cone is a passive bass radiator, which moves in response to the two woofers to reinforce the low-frequency output. 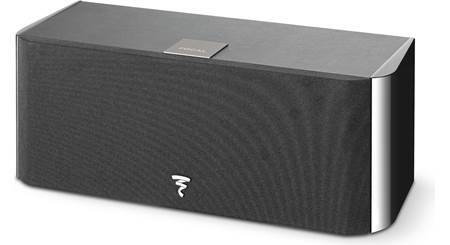 This gives you tight, tuneful bass that blends seamlessly with the tweeter for smooth, full-range sound. 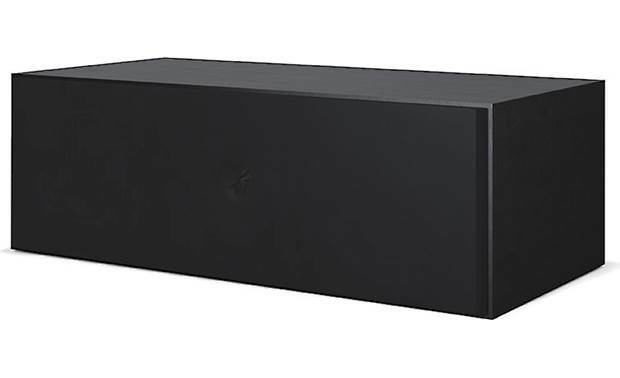 Uni-Q® driver array technology creates a large listening "sweet spot"
Uni-Q Driver Array: At the heart of the Q Series loudspeaker is the Uni-Q driver array. This signature innovation by KEF places the tweeter in the acoustic center of the midrange cone, with both drivers acting as a single point source. The result is a more detailed, accurate three-dimensional sound image, which is dispersed more evenly throughout the room than is possible with any conventional speaker. The Uni-Q driver array is made up of a 1" aluminum dome tweeter and a 6.5" aluminum midrange driver. 6.5" Aluminum Midrange Driver: The Uni-Q driver array's 6.5" midrange driver features an aluminum cone structure that has been engineered reduce cone breakup and improve midrange performance. The driver's optimized suspension allows more movement, better controlled excursion, and lower distortion for accurate bass performance. As well as allowing the driver's cone its full extension, KEF's ingenious Z-flex surround guides the sound from the tweeter across the surround without any disturbance or secondary radiation. Low-Frequency Woofer + Auxiliary Bass Radiator (ABR): Flanking the Uni-Q driver array is a 6.5" bass woofer and 6.5" Auxiliary Bass Radiator (ABR). The same aluminum cone found in the Uni-Q's midrange driver is also used in the 6.5" woofer and ABR for excellent low-distortion midbass/bass performance. The woofer's vented magnet assembly on a rigid metal chassis and 50mm voice coil offers incredible power handling, while the new rubber rear suspension of the ABR provides greater excursion and a lower tuning frequency so that the speaker can play deeper and louder. Both drivers feature a large roll surround that allows a longer throw with less distortion at high sound pressure levels. Sleek Cabinet Design: The sculpted Q Series finish epitomizes KEF's approach with seamless, sleek cabinets unblemished by visible fittings and joints. Q Series speakers are coated with a fine satin finish with matching driver colors. If you wish to conceal the drivers, an optional magnetically attached speaker grille (see Accessories Tab) is available and sold separately. 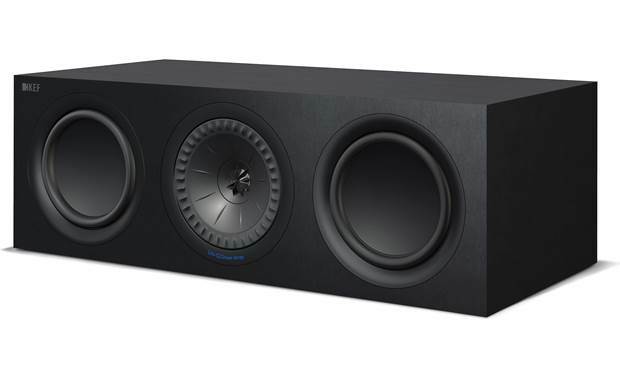 Centered Array: To optimize the high resolution purity of the Q Series center channel speaker, the Uni-Q driver array is positioned to the center of the cabinet to reduce unwanted internal resonance and adding refinement to sonic clarity and detail. Expect to hear clear highs and detailed midrange with minimum distortion at any volume level. Isolated Sealed Chamber: The Uni-Q driver array is isolated in a closed chamber inside the speaker cabinet to reduce distortions. The closed box midrange cabinet design reduces the load on the Uni-Q midrange cone, increasing clarity and detail while delivering cleaner, punchier bass. Mounting & Placement Options: The center channel speaker should be centered below or above your television. It can be placed on a speaker stand, AV stand, shelf, tabletop, or other flat surface. The included self-adhesive rubber feet protect your furniture and add approximately 0.1875" to the overall height of the speaker. 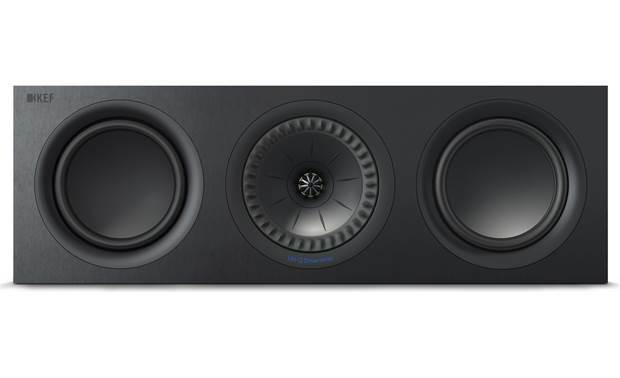 Searches related to the KEF Q650c Center channel speaker.